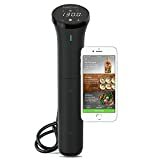 Anova has been the top brand in consumer-grade sous vide cookers for years, having played a huge role in popularizing the devices. In fact, most people out there probably wouldn’t even know what sous vide cooking was if not for Anova’s products. Now that you’re aware of how much better food tastes when it’s slow-cooked by an immersion cooker, it’s time to check out the latest and greatest new model. The Anova Culinary Nano Sous Vide Precision Cooker features a new design that uses less power than earlier models, but it cooks just as well. At under $100, it’s also less expensive than any of Anova’s earlier sous vide cookers.